We are committed to offering our clients exceptional, unparalleled value. Payment in full is required at the time of service. For surgical procedures, payment in full is required prior to surgery. 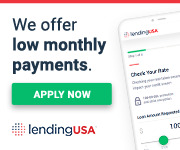 We offer financing options through CareCredit® and LendingUSA™. Both financing options allow for periods of no interest, and you can choose your repayment terms and your interest rate. There are no prepayment penalties. If you have Questions about financing or payment contact our office online or by phone at 330-364-5656 and one of our staff members will get back to you as soon as possible.